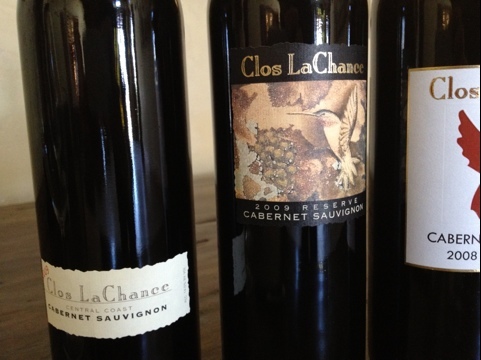 In April, Clos La Chance Winery in San Martin named Chardonnay their Wine of The Month. 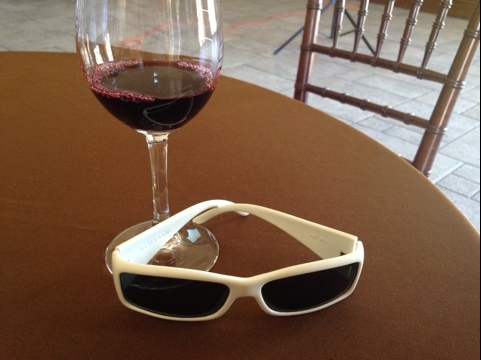 Some of you may recall that I reviewed some of their wines after visiting the winery. When I shared my post with CLC on Facebook, it entered me into a contest to win a bottle of their 2008 Santa Cruz Mountains Chardonnay. 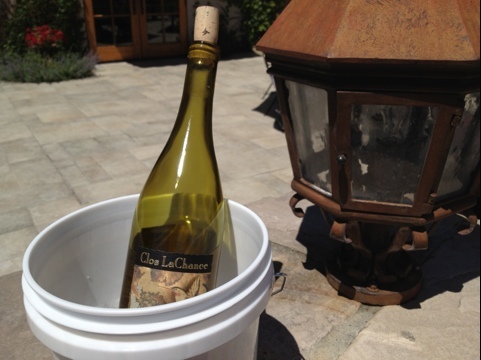 A cold bucket of Chardonnay on a hot day. You can’t beat that with a bat, foo. This past Sunday, we took a trip over to the winery to enjoy this beautiful bottle of Chardonnay on their patio. 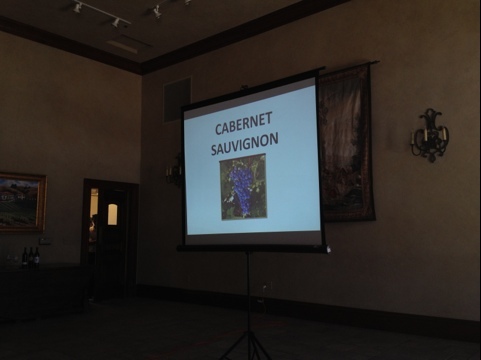 Yeah… Cabernet Sauvignon’s got class. It’s taught by Roy Froom. We started with the Estate Cab. Here are some facts about the wine. Nose: Blueberry and plum fruit with a hint of oak and chalk dust (You know I love chalk!). Taste: Fruits of blackberry, dry cherries, and red currant. There is a great acidity to this one, but the tannins are a bit too astringent for me. Color: On the red side of purple. Nose: Blueberry, lavender, and rubber balls. Yummy! Taste: There is a great chalkiness (Yes!) and acid play to this wine. I love the herbacious finish of rosemary and menthol. Good cherry fruit and tea leaf. Score: If you love blueberry, chalk, and tea leaf notes to your wine… You will love this… As do I. 93. You have to know that I would totally go back to school if all the classes I took were like this one. 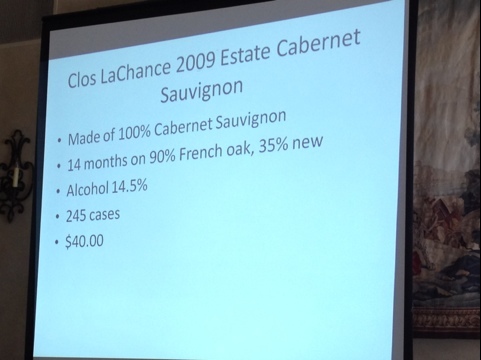 Thanks for the wine and the class, Clos La Chance. Now, can someone call me a Cab? This entry was posted on May 23, 2012 at 5:01 pm and is filed under Uncategorized. You can follow any responses to this entry through the RSS 2.0 feed. You can leave a response, or trackback from your own site. Some of their stuff can be hit or miss. Their Hummingbird (Grocery Store) Cab used to be a lot better. I’ve never put their wine in the awful category before, however… Which wine did you order? 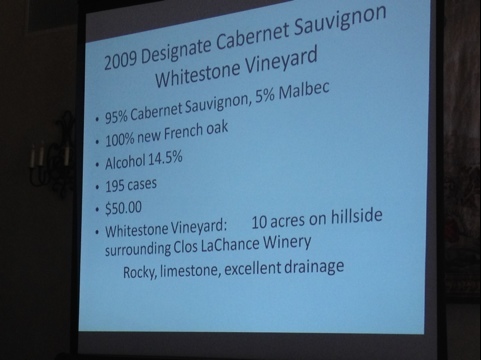 Were the cab grapes picked from the same vines for both wines? I noticed the Designate is from a surrounding hillside. Yeah. The Whitestone block is on this really hilly patch on the estate. The best of the best grow this block goes into the Whitestone. What’s left goes into the estate cab. Thanks, Jeff. Grapes love those hills don’t they?